We manufacture a wide range of Biscuit Rotary Molding Machines to our clients. Provided molding machines are widely demanded in different industries owing to their high efficiency in plastic molding processes.in different shapes and sizes. As with all our product range these too are fabricated with cutting edge technology using high quality raw materials to ensure durable and glitch free performance. 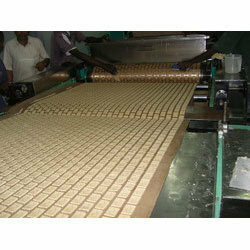 Established in the year 1987, we have been providing our clients with a wide collection of Biscuit and Conveyors. Our assortment of equipment consist Bakery Rotary Rack Oven, Empty Carton Lifting Conveyors, Loading Conveyors and Biscuits Machinery. Apart from these, we offer Flexible Roller Bearing Conveyors For Loading, Rotary Cutting Dies, Bread Machine Bakery Equipment and Internal Carton Handling Conveyors. All our products are widely appreciated by the customer due to their long functional life, easy installation, low power consumption, low maintenance and easy operation features. We are backed by our state-of-the-art facilities that enable us to fabricate all our products as per the specifications laid down by the clients to fulfill their exact demands within the schedule time. Our well-equipped manufacturing unit helps us in producing all the products as per the international quality standards. In addition to this, we have a team of experts, which helps us in providing our clients excellent operational training after the sales. For the convenience of our clients, we accept payment via cash and DD. Moreover, we deliver all our consignments by road or cargo, whichever is suitable to reach the clients’ end.